Family Party: 30 Great Games Winter Fun is the latest in the top-selling Family Party franchise, including Family Party: 30 Great Games and iParenting Award winner Family Party: 30 Great Games Outdoor Fun. 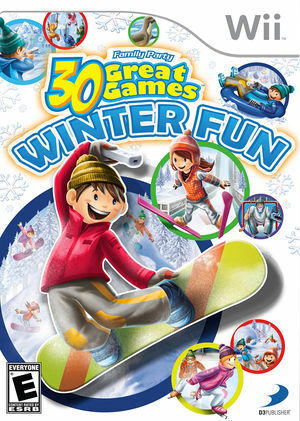 Winter Fun delivers hours of family entertainment on Wii where players can choose from over a dozen cute characters dressed head-to-toe in customizable winter outfits, and can participate in up to four player action including multiplayer co-op, available for the first time ever in the franchise. Players will be getting in the spirit of playing all-time favorite winter games and competing and unlocking games and challenges to achieve high scores and win medals! The graph below charts the compatibility with Family Party: 30 Great Games Winter Fun since Dolphin's 2.0 release, listing revisions only where a compatibility change occurred.